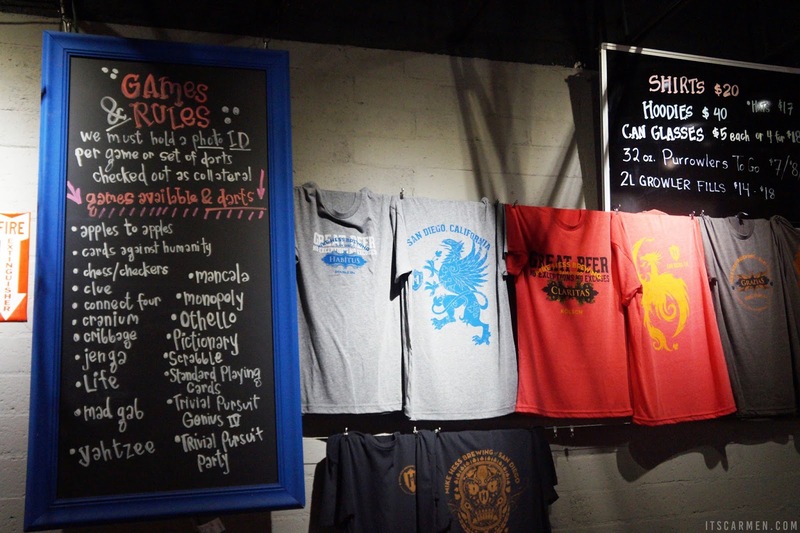 San Diego is pretty much the Mecca of craft beer. 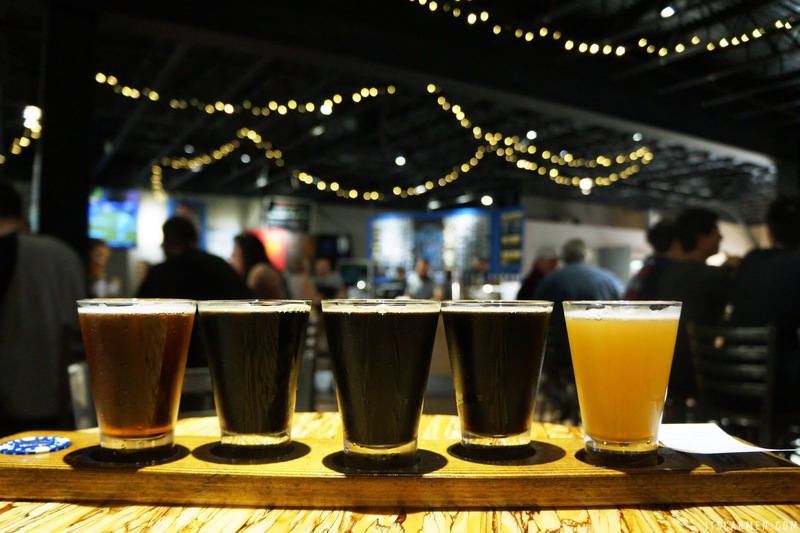 You'd have to go on several brewery tours before you'd even make a dent; as of right now there are over 125 breweries. Yeeshk! 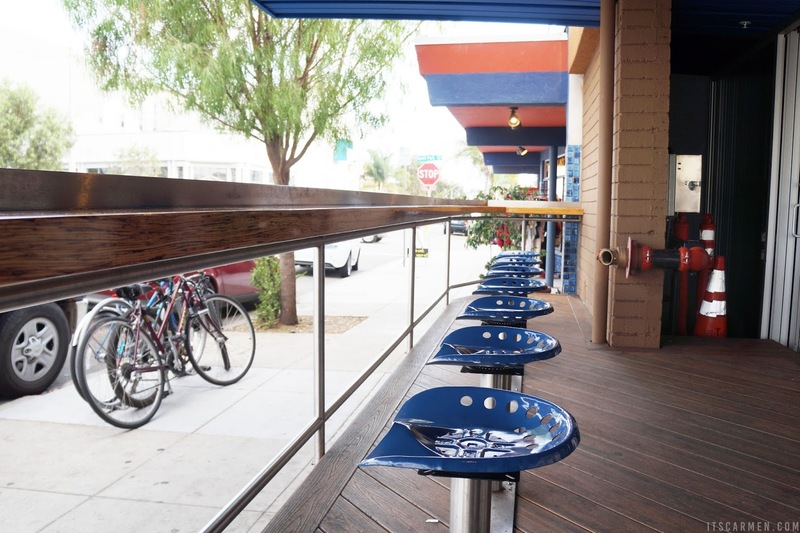 Local to San Diego, Mike Hess Brewing* has three locations within the county: North Park, Miramar, & Ocean Beach. I visited the North Park location. 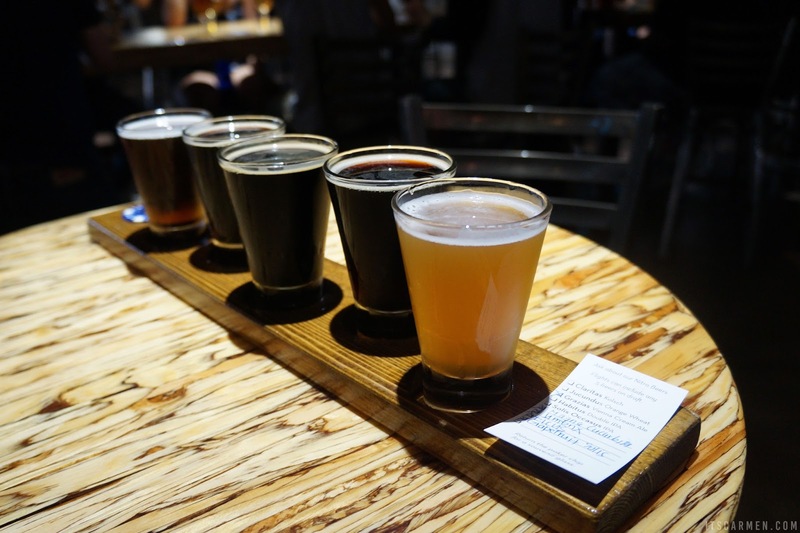 I went up & introduced myself; they told me to choose five tasters from their list of brews. My boyfriend & I eyed the list, narrowed it down, & made our choices. Then they pointed me in the direction of my reserved table. 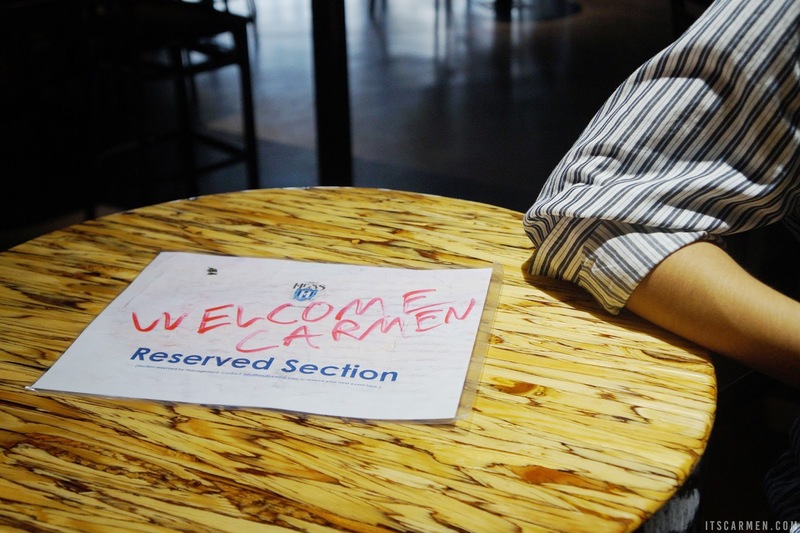 "Oooooh, I have a reserved table," I said to Fred. I felt so special. Mike Hess has an industrial look with exposed ceilings, peppered with fairy lights. There was a mixture of long rectangular wooden tables & some small circular ones. My reserved table was the little one, perfectly fit for two. You also have the opportunity to check out some games & play with your homies to give it a more joyful experience. There's an outside seating area so you can people watch as folks pass by. Grazias - This is a tasty, mild Vienna cream ale. It's delicious & goes down easy. I'd say this is the perfect brew for those who want a scrumptious beer or aren't the biggest beer fans. 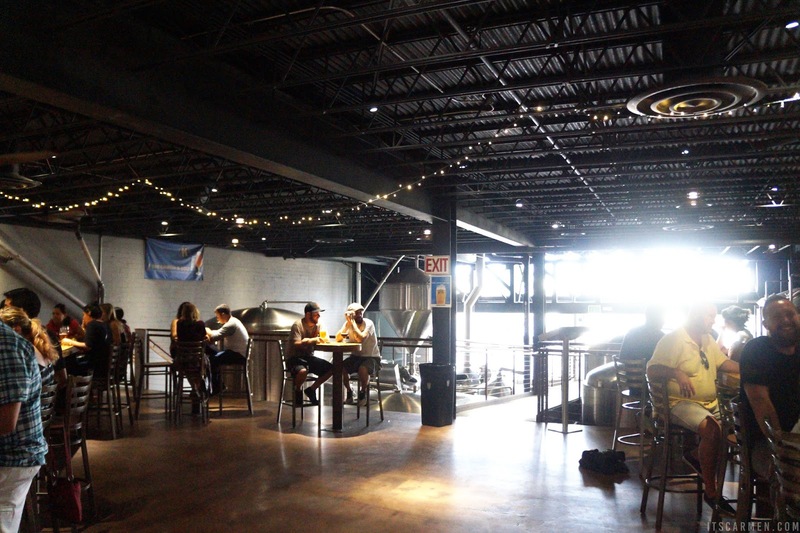 Grazias is a great starting point for beer enthusiasts & beer hesitants alike. Magna Cucurbita - Ding ding ding! This was my favorite beer hands-down. Magna Cucurbita is a dark pumpkin stout -- ideal for the autumn season. It's lovingly spiced & quite fragrant. I could see myself enjoying this throughout fall. Umbrix - I'm a huge fan of stouts especially when the temperatures cool down. This is a rye imperial stout with a potent but smooth taste. The flavors include rye malt, coffee, chocolate, & toffee. It has a 10.2% ABV so it's pretty high in alcohol content. Ficus - A dark Belgian saison beer with organic, locally grown figs. It's sweet & rich & packed with flavor. In fact, over 10 pounds of figs are used per barrel. This is a unique beer & bonus points for Mike Hess Brewing supporting local farms. Grapefruit Solis - I'm a sucker for grapefruit; it's one of my favorite citrus fruits out there. This beer is light & tangy but the grapefruit wasn't coming through as much as I would like. The citrus flavor was quite mild. Mike Hess has great beer. My favorite of the bunch: Magna Cucurbita, just because I love seasonal beers. Count me in for a dark pumpkin stout. After we sampled the flight of tasters we returned the Mike Hess chip in exchange for a glass to take home. 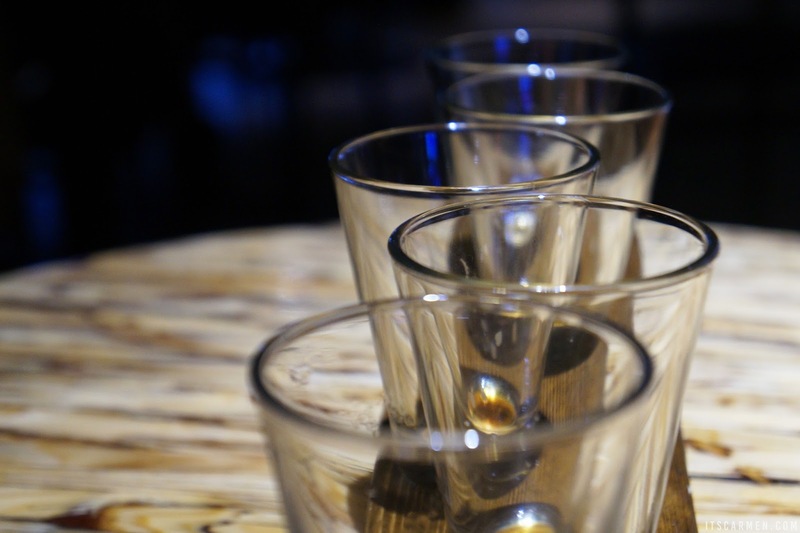 The taster flight with the glass would normally cost $15. That averages out to $2 per taster & a $5 glass. 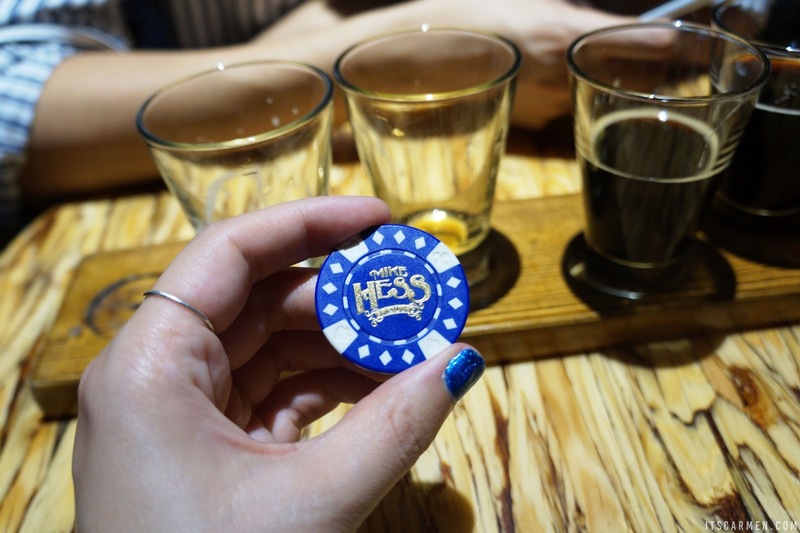 Hess Brewing is one of my ALL TIME FAVES! I actually live a few blocks away from their North Park location. I like it because it's dog-friendly and the food trucks they have are always great, however it can get pretty hot and noisy. 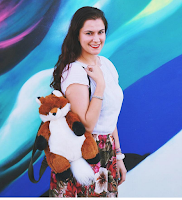 How cool you got free beer for a review - that's my blogging dream! Any advice for a fellow beer blogger? Thanks - love the post! Their Grazias Vienna Cream Ale is my favorite choice! 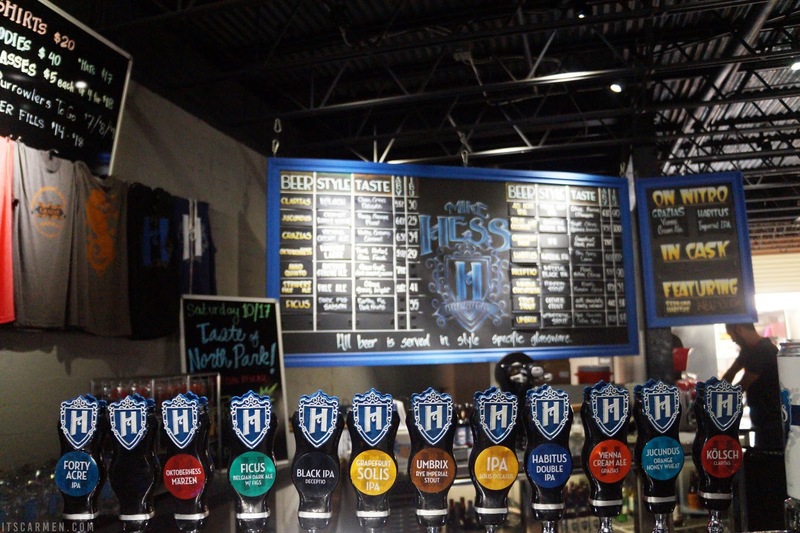 I love going on beer tours, luckily I live in Milwaukee, WI so it is plentiful.If I get a chance to visit San Diego I will make sure to put Hess Brewing on the list of places to visit. Looks like a decent place . Hopefully you can have more time to enjoy it on a not so crowded night. Sounds like you had a lovely time! I love the interior design of the place. Great post! We don't have Mike Hess down here in the south, but it sounds like a fun place despite the noise. And that pumpkin stout sounds delicious. Ah the Grapefruit Solis sounds amazing! Great photos! Glad you had a nice time! Wow lovely photos, such a nice place. Great photos!! 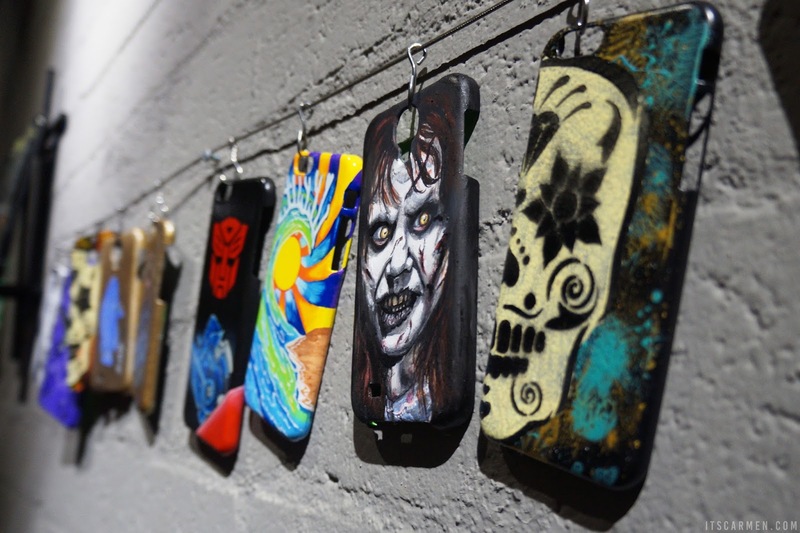 Love that cases!! This place seems incredible and the beers delicious! Seems you had a fabulous time. If i visit to San Diego someday I'll sure stop by. This place looks really cool! I'll have to check it out some time. Thanks for sharing! This place looks really fun!